Weighing around 60 grams and being about 9 mm thick, the Tachi is a combination blade with forehand and backhand sides that possess quite different characteristics. 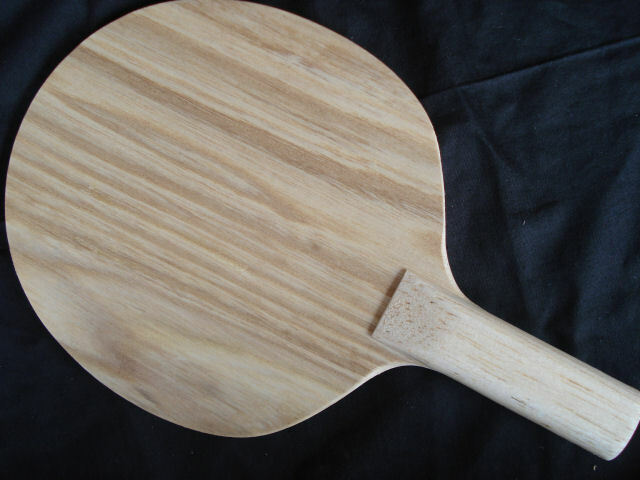 The forehand (rated ALL+) consists of four thin wooden plies providing high control and spin, and medium high speed. 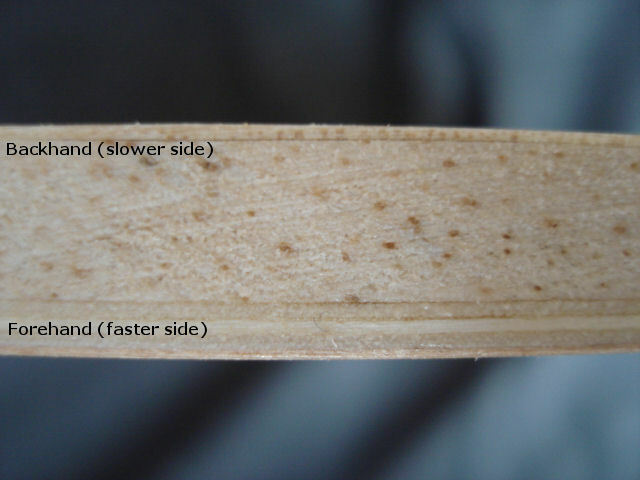 The backhand (rated DEF) consists of a thick balsa ply and a very thin wooden outer ply providing low speed, high control, and high spin-reversal on soft to medium hard contact with the ball, but in contrast – due to the special catapult-effect of balsa – relative high speed, higher spin-reversal but less control on hard contact. The blade is overall relatively stiff and low-throw, producing a flat ball-trajectory, but its throw is slightly higher on soft contact and lower on hard contact. The Tachi is purposely designed for a close to the table style featuring backhand blocking with long pimples-out rubber and forehand attack with an inverted or short pips-out rubber. However, its very controlled and slow backhand enables similar syles of play as well, viz. styles with an emphasis on forehand attack and backhand control using inverted or short or medium pips, or a mix of them. 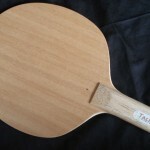 The Tachi’s forehand combines well with inverted rubbers and short or medium pips-out rubbers. 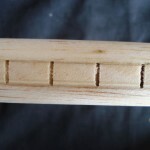 Relatively fast rubbers (OFF- or faster) will add to the difference between forehand and backhand. 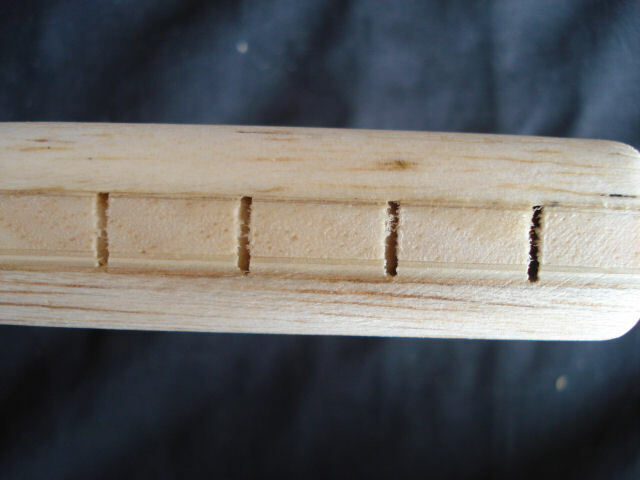 As the forehand plies offer qualities consistent with high-spin looping, pips-out rubbers should be very fast and have relatively thin sponge (1.5 to 1.8 mm) if classic pips-out effects are required. 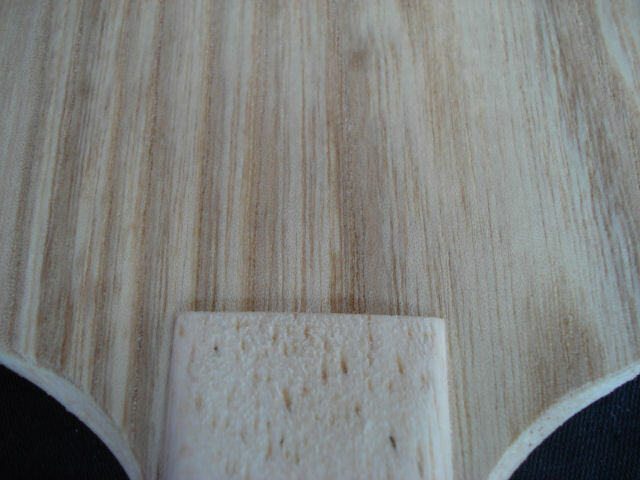 If, however, the player’s main needs are only speed and relative insensitivity to incoming speed, thicker sponge can be used as well. 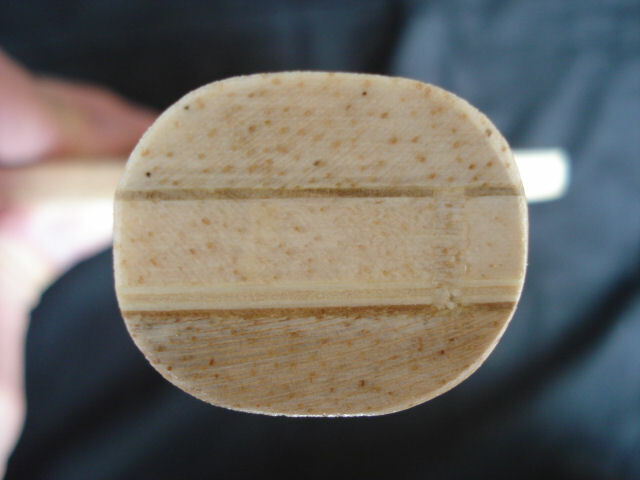 Fast inverted rubbers of the modern Chinese type (medium to hard sponge and tacky topsheet) are very suitable for the Tachi’s forehand, as are Japanese and European type tensioned and tuned rubbers with medium to hard sponge, in any thickness required, but best 1.8 mm or thicker. 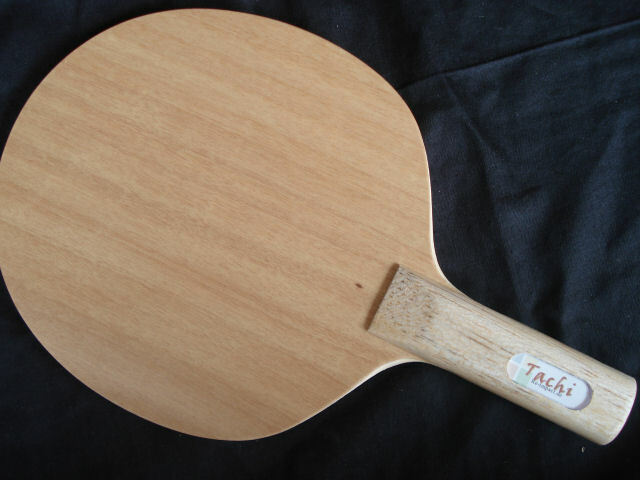 The Tachi’s slow and controlled backhand combines ideally with medium to high speed long pips-out rubbers without sponge. Slower rubbers will, especially on soft to medium hard contact with the ball, take off so much speed that the return will land closely behind the net, but deeper balls are at risk of being somewhar harmless because of the lack of speed. 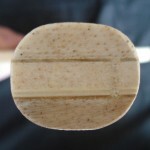 Pips-out rubbers that reverse spin well should be used for passive blocking and chop-blocking; rubbers offering more friction do well for aggressive blocking and countering on the Tachi’s backhand. 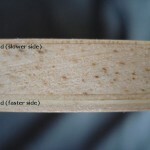 Inverted rubbers and short or medium pips-out rubbers should have medium to hard sponge because of the effects of the thick balsa layer. 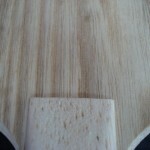 Thickness of sponge over 2.0 mm is inadvisable. 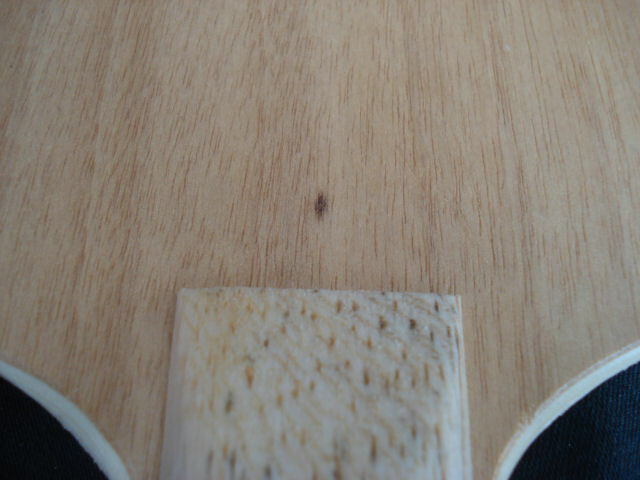 The thick balsa ply in the Tachi’s backhand will absorb speed on soft to medium hard contact with the ball, but if contact is harder (incoming fast loops or smashes) the backhand will suddenly become much faster and hence less controlled. 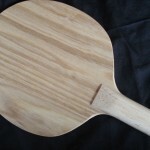 If the player does not have the technique required for soft-blocking fast incoming balls, it is more effective to counter-block them: with the blade slightly closed and going upward, pressing the ball firmly but without much force forward over the net. As the incoming spin will be reversed on these active blocks, they must not generate too much speed, or else the ball will float and overshoot the table. Slow loops having a lot of spin, which are difficult to handle with most set-ups using OX LPs, may be hard to deal with the Tachi, too. 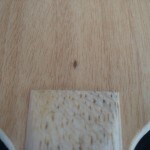 The ball, being slow and thus contacting the blade rather softly, will lose even more of its speed because of the braking effect of the balsa; added to its high spin, this will result in much higher friction (for a long pimple) if a passive block is attempted, and as a result the ball will tend to be returned too high. A better choice is to play a soft topspin-block (or “roll”), closing the blade a bit and using the wrist for a quick loop-like motion. This will take off enough of the spin to make the return a controlled one. Even so, there will still be backspin on the ball (if the rubber is of the well-reversing type), so forward speed must be low to medium or the ball will float long. As an alternative, these balls can be safely chopped or chop-blocked aggressively, moving one step away from the table.